InterfaithFamily.com has been named one of the nation’s 50 most innovative Jewish nonprofits in Slingshot ’10-’11, a resource guide for Jewish innovation. Since 2005, Slingshot has become the definitive guide to identifying path-finding and trailblazing organizations grappling with concerns in Jewish life such as identity, community, tradition, and basic needs. InterfaithFamily.com is also one of only ten organizations to receive a capacity building grant from the Slingshot Fund. As the premiere web based resource for interfaith couples exploring Jewish life, InterfaithFamily.com empowers these couples to engage in Jewish life and make Jewish choices and helps their families embrace the choices they make. 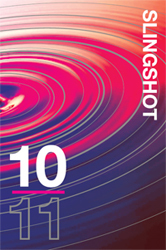 Slingshot ’10/’11 was unveiled on October 18 at the second annual Slingshot Day launch event in Manhattan. Over the years, Slingshot‘s role in the national and international community has increased dramatically, which is evidence of the growing community of innovative nonprofits and the funders who support them. Slingshot was created by a team of young funders as a guidebook to help funders of all ages diversify their giving portfolios with the most innovative and effective organizations and programs in North America. This guide contains information about each organization’s origin, mission, strategy, impact and budget, as well as details about its unique character. Now in its sixth edition, Slingshot has proven to be a catalyst for next generation funding and offers a telling snapshot of shifting trends in North America’s Jewish community. The book, published annually, is available in hard copy and as a free download at www.Slingshot.org.